HA note: The following is reprinted with permission from Libby Anne’s blog Love Joy Feminism. It was originally published on Patheos on May 14, 2014. Sometimes I feel like I have to play this thing from both sides. When I and other bloggers talk about some of the problems in the conservative Christian homeschooling subculture, we are informed by secular homeschool parents that not all homeschoolers are religious, and in fact that religious homeschoolers are just a minority today and not really a problem to be worried about. Well yes, we know that not all homeschoolers are religious. However, it’s a simple fact that many—perhaps even the majority—are. When I read comments on mainstream news articles about things like Clare being kicked out of her homeschool prom for her dress, I see individuals who assume that all homeschoolers are religious, that all homeschooling is about religious indoctrination, and that homeschooling should therefore be shut down plain and simple. This is not helpful and certainly not true. There are secular homeschool leaders, textbooks, support groups, and conventions. A significant and growing percentage of homeschoolers are not religious homeschoolers. And here I am, caught in the middle of misperceptions on both sides. There is a lot I could say here, but I think it might just be simplest to quote from information put out by the Coalition for Responsible Home Education. This passage comes from “Reasons Parents Homeschool,” a page on the organization’s website. Sociological research on homeschool families and their motivations, practices, and characteristics suggests that, going back as far as the late 1970s and early 1980s, there have been two main groups of homeschooling parents. First are evangelical and fundamentalist Christians who want to give their children a Christian education, and second are progressives who believe that formal schooling stifles children’s natural creativity and that education takes place best outside of the classroom. Throughout the past three decades, these two groups have coexisted in what sociologists and historians have described as an often uneasy tension. While the two groups at times cooperated, they also each created their own local, state, and national homeschool groups, conferences, and organizations. Research suggests that those with religious motivations have been the larger group by far since the 1980s, and that this group has also been the more successful at networking and building organizations and infrastructure. Recent work suggests that these two groups continue to exist with very similar motivations and characteristics as in the past. 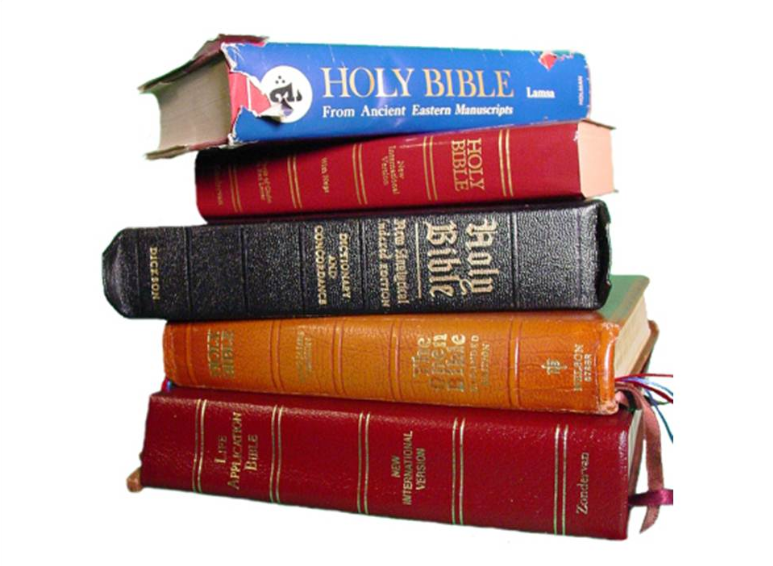 Many parents today continue to homeschool for religious reasons, and religious homeschool curriculum is common. Conservative evangelical speakers teaching the supreme importance of the family and the scientific reality of creationism make their rounds speaking at homeschool conventions and before homeschool audiences across the country. At the same time, progressive educational reformers such as John Taylor Gatto speak at “unschooling” conferences and gatherings, encouraging parents to forgo classrooms and textbooks and engage in radically child-led learning. Even as many parents continue to homeschool for religious or pedagogical reasons, recent sociological work suggests that an increasing number of parents are choosing homeschooling for purely pragmatic reasons: because the academic quality of the local schools leaves something to be desired, or because of bullying or health problems. Some families homeschool in order to be closer as a family, or simply so that children may have access to an individualized education. While homeschooling in the past has often been an act of religious or pedagogical protest, homeschooling has today become mainstream and accepted as a valid educational option. In an era of increasing school choice, parents turn to homeschooling for a variety of practical reasons that are often very family-specific. I also want to quote briefly from “How Have Scholars Divided Homeschoolers into Groups?“, which adds another dimension to this. Feel free to read these entire pages if the excerpts interest you. 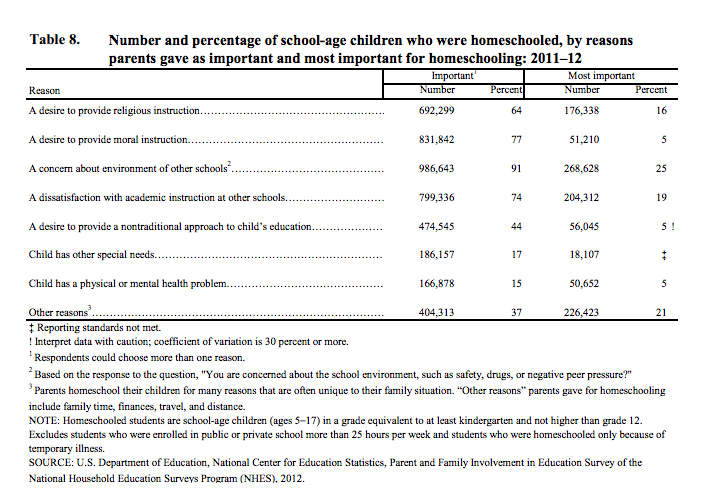 The basic point I want to make is that, yes, religious homeschoolers make up a significant percentage of both the homeschool population and the infrastructure of the homeschooling world, and that, at the same time, there are many who homeschool for pedagogical or pragmatic reasons that have nothing to do with religion. It is wrong to assume that all homeschoolers are religious (or that all religious homeschoolers are extremists) and it is wrong to assume that religious homeschooling is a marginal or insignificant part of homeschooling as a whole. I want to finish with a chart from the National Center for Education Statistics. The data displayed was collected in 2011. When reading the chart, bear in mind that many scholars feel that sociological work may get at parents’ motivations more accurately than a survey of this sort. I tend to agree, as my parents might put academics down as their number one reason for homeschooling on a survey like this even though they are very clearly and solidly religious homeschoolers. Further, “a concern about environment of other schools” may mean a variety of things, religious or secular. Finally, some scholars question whether religious homeschoolers may be less likely to participate in a government survey of this sort, and whether that may skew the results. If you want to read more, you may also find “A Brief History of Homeschooling” and “Homeschool Demographics” of interest. We had 2 dyslexic children whom we homeschooled because no public school system could do what we could. They were isolated and hungry for playmates and the only ones available were evangelicals. The no. of times they were invited to Awanis to be “saved” just for the chance to play basketball, I cannot count. They both are thoroughly enjoying public school now tho we still have to fight the battle for appropriate accommodations and recognition that theirs is a physical problem not an intellectual one. My other comments have not passed moderation so I leave this one here only because I need to say once more that evangelicals do NOT define Christian. We are Christians. We are denominational church Christians. Having lived for many years in non Christian countries and – no not for missionary work- we made a study of theology and the history of Christianity so we would have a true understanding of the religion we chose. The Niocene Creed means something to us. We are religious and Christian and frankly our studies make it very clear the nondenominational churches are theologically cults. Our Reverend, a graduate of Princeton’s theological school and Navy Chaplain for decades was labeled a “heretic” by the local lay ministers who moved into the area thanks to the Discovery Institute. It would have been a devastating blow to our children to not have had the chance for us to homeschool. So ,yes, it is important to remember that others do not abuse the right to HS. That it sometimes is the best option for children. And that you can HS for academic reasons and still be “religious.” That evangelicals do NOT DEFINE CHRISTIANITY. Neither my or my husband’s degree was in teaching. To have required one of us to get a teaching degree would have blocked us from homeschooling so I do not see this as a good way to regulate homeschooling. In Germany homeschoolers have to pass the same exam as the public school students for graduation. Our children took the ACT’s every year so that we could measure them against public school’s with the same idea. German homeschooled children simply have to understand evolution for example and scientific method to the point of being able to pass the test with their peers. They can believe what they want and parents can teach whatever belief they want – as long as the facts are taught and retained. Hardly worthy of refugee status. In fact supposedly what those who say they want “both sides” of evolution taught in public schools say they want. We know because at one point we almost had to relocate to Germany. It was often painful to see the experience of many of the children we saw from the evangelical homeschoolers. I can sympathise here reading their stories because I could see the same stories around me at the time and felt powerless except to offer another example of Christianity, parenting, and education. If in your anger you do not feel that was enough, I would ask you to please consider that wo homeschooling my children would not have gotten the help they needed and would be barely literate today rather than having the potential of going on to higher education. Thanks for mentioning this. We are unschoolers, so even though we are Catholic, we aren’t interested in using homeschooling as a way to make our kids follow our religion. We hope they do, but we want to expand their options and worldview beyond what the public schools can do, not contract it. We want to raise them to have a healthy skepticism of anything someone tries to sell them, and to look for facts to give answers. We don’t ever spank our children, and we let them question and talk back because we want them to be comfortable questioning authority. But since we’re Catholic, and since many of our friends and family are homeschooling for religious reasons, we face a lot of assumptions from others. They assume we’re homeschooling for the same reasons they are, and therefore will want to homeschool the same way. It’s getting so I am trying to find new friends in secular homeschooling and unschooling groups, just to find some people who agree with us on education and parenting! The problem that bothers me is how to find laws that can protect homeschooled kids from abuse without pressuring them to follow the public school’s pedagogical system. Maybe my kids won’t always be on grade level for everything, but that doesn’t have to do with my restrictions, just their readiness. It kind of ruins the point of unschooling to be constantly pressuring your kids to be on grade level with everything. And of course we are not interested in following an “approved” curriculum, doing standardized tests, that sort of thing. We want to learn from life. How are the advocates of tighter homeschooling laws going to ensure that they aren’t forcing us all onto the public schools’ pedological model in their efforts to make sure religious homeschoolers are being taught at all?